You know, I know that this steak doesn’t exist. I know when I put it in my mouth, the Matrix is telling my brain that it is juicy and delicious. After nine years, do you know what I’ve realized? 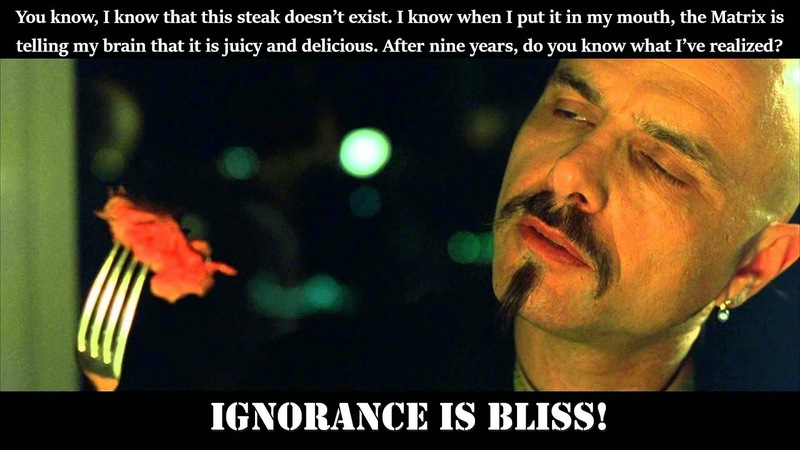 The Matrix (only the first of the trilogy) was arguably one of the more philosophically intriguing movies in recent memory, I could probably write like a whole bunch of posts based on the movie, but I want to talk about the Cypher quote above in particular right now. If you read the title of this post, you must be wondering to yourself now, “What the heck does the Cypher quote have to do with love?” You see, the Cypher quote is intriguing because it’s not exactly unreasonable. What exactly is life? Many will say that life is the sum of our experiences. Understandably, everyone is driven by outcomes in life. We do things because we believe it will make us feel good. There is action and there is reaction. I want to find meaning in my life, because I believe I will feel good about myself if I have meaning in my life. I want to buy a good car, because I think I will get a rush driving it down the street. I pay my taxes, because I don’t want the income tax department knocking on my door. You could argue that it’s not quite as simple, like maybe I pay taxes because I was educated to be a good citizen of this country, or that I believe the nice social infrastructure that I enjoy is a result of me paying taxes. But the point is, I do things a certain way because of the final impact that it has on my senses and experience. And I regret some of my actions because I fail to factor in things that impact me in a negative way or maybe I was dumb enough to believe I can outsmart it. Such as people who decide to steal because they believe they can outsmart the police. You ever think about why you fall in love? What is love? What is it that we really want from connecting with another person? I believe we are addicted to certain emotions that certain people can trigger in us. It’s all about feelings; we call those feelings “chemistry”. Attraction isn’t a choice. Given these observations, it’s hard not to agree with Cypher. Does it mean that we are just selfish beings who do things to satisfy ourselves? Does nothing else matters other than fulfilling our feelings and longings? Consider the example of people buying insurance. Why do people buy life insurance to ensure the future of their significant other or dependents? Sure, if you are religious, you can argue that people buy life insurance because they can observe from heaven. But many others who don’t believe in consciousness after death still buy insurance. Why is that? Aren’t people like that better off by purchasing something for themselves than to pay the insurance premium? This shows that there are things we intrinsically value other than our own individual experience. Let’s consider another example. I think I am not alone when I say I place a great value in not being deceived over my own feelings of joy. Suppose somebody acts if he/she loves you, but internally he/she doesn’t feel much for you and was only with you for the money or lifestyle. For me, I rather know the truth and live a life of solitude than to live happily ever after thinking I found the love of my life. In the end, I think what defines us as human and what make Cypher’s viewpoint really fall apart is the great value we place in triggering feelings in other “real humans”. People write great novels, compose great music, paint great art, engineer great products, and discover great physical laws; not because they want to enjoy the benefits of being famous or rich. Rather they do it because they want others to feel that same humanity that triggers and drives them. We love inspiring others, creating something that communicates and excites others. We like telling stories and hearing them, because we want to share and understand vision with other humans. It’s about expressing ourselves and invoking reflections in others. We want to understand and be understood by others. That said, perhaps love is the ultimate expression of ourselves, finding somebody who you trust to share the best and worst of you. Being the One is just like being in love. Nobody can tell you you’re in love. You just know it. Through and through. Balls to bones.